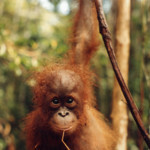 LET'S SAVE OrangUtans & Tigers from EXTINCTION!! Some Scientists say they might be EXTINCT in the next yrs!!! Causes: DEFORESTATION: 300 SOCCER FIELDS of Rainforests CLEARED EVERY HOUR in SEAsia to produce PALM OIL;ILLEGAL LOGGING;PET TRADE..
Its production has been documented as a cause of substantial and IRREVERSIBLE damage to the Natural Environment; impacts: Deforestation, Habitat loss of criticaly Endangered Species such as the Orangutan and Sumatran Tiger, (Java and Bali Tigers already EXTINCT), and a significant increase in Greenhouse Gas Emissions, contributing to Global Warming; very popular for Biofuel, but the environmental impact from growing large quantities of Oil Palms has called the use of Palm Oil into question. The Pollution is exacerbated because many Rainforests in Indonesia and Malaysia lie atop peat bogs that store great quantities of carbon that are released when the forests are cut down and the bogs drained to make way for plantations. Environmental Groups such as Greenpeace claim that the Deforestation caused by making way for Oil Palm plantations is far more damaging for the Climate than the benefits gained by switching to Biofuel. A common cooking ingredient in Africa, Southeast Asia and parts of Brazil. Since Palm Oil is of a lower quality than Olive Oil, it remained rare outside West Africa. Its increasing use in the commercial Food Industry... because: 1) Palm Oil has the LOWEST Production COST of the major Oils, and 2) Products last more time in the Supermarket shelves!! for the high oxidative stability (saturation) of the refined product when used for frying. Many processed foods contain Palm Oil but it is NOT DECLARED on Labels!!! Or Label simply says: "Vegetable Oils"!! Try to read a Chips Packet Label, just as an example!! This is a real offence to all of us, but particularly to VEGANS and VEGETARIANS devoting their lifestyle not to hurt animals, while, like all customers, they are unwillingly and unconsciously contributing to the SLAUGHTER of Tigers, Elephants, Rhinos, Wildlife... and GENOCIDE of Orangutans, who share 98% DNA with us!!! The U.S. Center for Science in the Public Interest said Palm Oil (high in saturated and low in polyunsaturated fat) promotes heart disease; Report cited Research going back to 1970; also said that The National Heart, Lung and Blood Institute, World Health Organization (WHO), and other Health Authorities urged reduced consumption of Palm Oil; WHO states that there is convincing evidence that palmitic acid consumption contributes to an increased risk of developing cardiovascular diseases. A 2006 Study by the National Institute of Health and the USDA Agricultural Research Service concluded that it's not a safe substitute for partially hydrogenated fats (trans fats) in the Food Industry, as Palm Oil results in adverse changes in the blood concentrations of LDL Cholesterol and apolipoprotein B just as trans fat does. Palm Oil became a highly sought-after commodity by British traders, for use as an industrial Lubricant for machinery during Britain's Industrial Revolution; the basis of Soap products, such as Lever Brothers' (now Unilever) "Sunlight Soap", and the American Palmolive brand; derivatives of palmitic acid were used with naphta during World WarII to produce Napalm; to create Biodiesel. 1. Indonesia: As of 2009, was the largest Producer, surpassing Malaysia in 2006, producing more than 20.9 Million Tonnes; aspires to be the World's Top Producer; FAO data show production increased by over 400% between 1994–2004, to over 8.66 Million metric Tonnes; is looking to produce Biodiesel. Cargill is building new refineries and mills in Malaysia and Indonesia, expanding its Rotterdam Refinery to handle 300,000 tpa, acquiring plantations in Sumatra, Kalimantan, the Indonesian peninsula and Papua New Guinea. 2. Malaysia: The World's 2nd largest Exporter; the Government is encouraging the production of Biofuel feedstock and the building of Palm Oil Biodiesel Plants; domestically, is preparing to change from Diesel to Bio-fuels, drafting legislation that will make the switch mandatory. About 60% of Exports are shipped to China, the European Union, Pakistan, U.S.A. and India, as cooking oil, margarine, specialty fats and oleochemicals. My Great Wish: Pls INVITE friends to JOIN Group!!! HEALTHY Eating: 175 Pet. New! !